We’re not sure what it is with Australians and killer suspension components, but there are a fair number of Oz-based companies making them. For that, handling geeks around the world are grateful. Whiteline is one of the standouts. They make sway bars, lowering springs, bushings, and other suspension components that deliver significant gains in vehicle balance, steering precision, grip levels, and outright driving fun. Whiteline earned its chops with Japanese and European vehicles, but we thought you owners of late model Mustangs, Focus’ (Foci?) and Fiestas would like to see what Whiteline can do for your handling. Let’s take a look at some parts. If you can only install one part at a time to improve handling, start with a set of sway bars. They are designed to reduce body roll, which spreads lateral loads more evenly across the tires to increase grip in the corners. 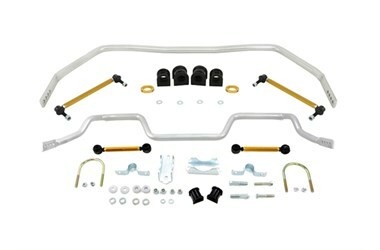 Whiteline makes fixed-rate and adjustable sway bars. The adjustable bars let you fine-tune your car’s handling—set your bars to maximum stiffness for track use, then dial them back for the trip home. Whiteline sway bars come with urethane bushings and necessary hardware. Whiteline caster correction control arm bushings improve handling and straight-line stability, and provide increased cornering grip by adding more static caster and dynamic negative camber gain. The polyurethane bushings also reduce vibration and noise—no squeaks and no need to grease. Whiteline Roll Center Correction Kits raise the front roll-center of your Mustang to increase front roll resistance and reduce suspension compression of the outside front wheel during cornering. The result is more even weight distribution and improved tire contact for better front end grip and higher cornering speeds. The kits feature ball joints with three adjustment settings to fine-tune the roll center for varying vehicle heights. We've received your request and have sent an email to the address you entered. Your friend should be receiving the email shortly. Sorry, there was a problem sending this email. The issue has been logged. Please try again. You can edit message (optional).